The second unit of the Atucha nuclear power plant in Argentina today reached 100% of its rated power, completing an increase in the share of nuclear power in the country's electricity mix from 7% to 10%. The plant is located in the town of Lima, Zárate, Buenos Aires. 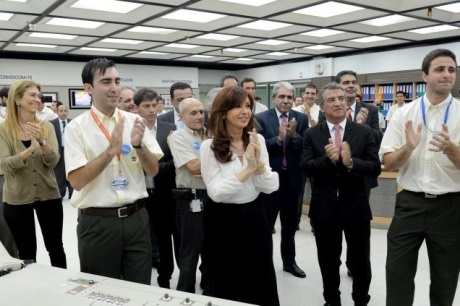 Today's milestone for the unit - named after former President Néstor Carlos Kirchner - was witnessed by Argentinia's President Cristina Fernandez. Fernadez said during the unit's inauguration ceremony that, in revitalizing the country's nuclear power program, Kirchner had proved himself to be the kind of leader "who makes history", like his predecessor President Juan Domingo Perón, the namesake of Atucha 1. Now, the National Atomic Energy Commission is attracting "new young blood" to its workforce at the uranium enrichment plant at Pilcaniyeu, Fernandez said, stressing that Argentina is a leader in nuclear nonproliferation. Today, Argentina has 129 companies in the nuclear power sector and 5220 specialists. Atucha 1 began operating in 1974 and in 1979 construction of Atucha 2 was ordered following a government decision to have four more units coming into operation in 1987-1997. Then in August 2006, the government announced a $3.5 billion strategic plan for the country's nuclear power sector. This involved completing Atucha 2 and extending the operating lifetimes of Atucha 1 and Embalse. As well as generating electricity, Embalse also produces cobalt-60 for uses in medicine, industry and food irradiation worldwide. Atucha 2's rated power is 692 MWe and together with Atucha 1 and the reactor at Embalse it establishes Argentina's total nuclear generating capacity at around 1627 MWe. The Carem small reactor project should add a further 27 MWe by 2018. The country's next two reactors planned are likely to be built by China National Nuclear Corporation. In February, Argentina and China ratified an agreement signed last year to work jointly on a project to build a fourth nuclear power reactor in the Latin American country. "We went to China to seek investment to incorporate two new plants, one of 700 megawatts and another 1000 megawatts," Fernandez said. "No one needs to panic," she said, because the first will be 70% owned by Argentina and ownership of the second will be split 50:50. Hydro and nuclear power have to be "absolutely complementary" in the country, she said, "but we must place much more emphasis on nuclear energy, which is cheap and clean generation technology." In addition, nuclear power is vital to the country's medical sector, she said. Argentina produces 5% of the world's molybdenum-99 and one-third of the global supply of cobalt-60. she said. The country has also “returned to the select club of 11 countries" that can produce enriched uranium.